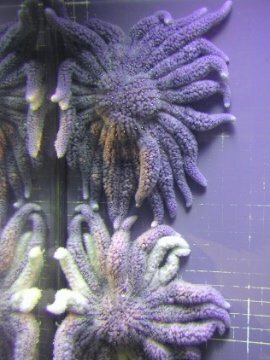 The Echinoblog: Sunflower Starfish Video Day! aka Pycnopodia Power! Sunflower Starfish Video Day! aka Pycnopodia Power! Its been awhile since I've had a chance to share some cool starfish videos and there's some awesome new sunflower star video on YouTube! 1. The "mound" of moving Pycnopodia helianthoides ! A video from the Vancouver Aquarium. Research diver Donna Gibbs was out and observed this spectacular spectacle. I dont' think I've ever seen a huge aggregate of sunflower stars like this before! Literally climbing over each other in high densities. The Vancouver Aquarium folks speculate on temperature or red tides as the cause..I wonder if it might be some kind of odd reproductive behavior. Anyway...its weird and spectacular! 2. Sunflower stars battlin it out! Nuff said! 3. Sunflower star TIME LAPSE turn over. If you don't love watching starfish time lapse-then you have become TIRED OF LIFE!!! 4. Sunflower Stars VERSUS the SCALLOPS!! Watch the Godzilla of starfish terrorize a bunch of hapless bivalves! ha! Silly Scallops!! Watch them RUN! 5. Finally... there's always THIS favorite... Sunflower star clears out the hapless brittle stars and sand dollars around it! THAT is who's boss! All to a hip soundtrack of Vivaldi's Four Seasons!